I have a real weakness for interior illustrations, so much so that I gave them their own entry in my book. Whereas most interior photographs are meant to capture a room as it actually appears, interior illustrations are prone to a bit of artistic license. 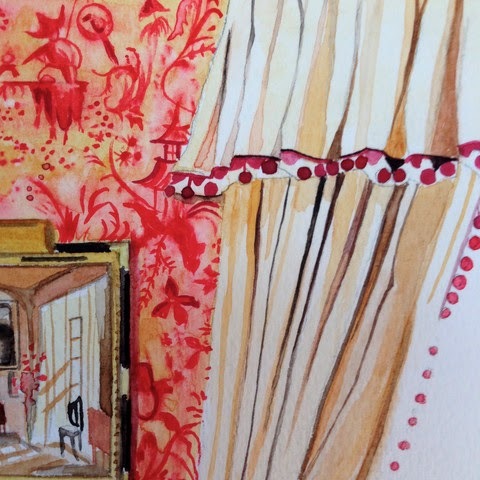 It's not that illustrations don't accurately reflect a room's appearance. It's that they do so with flair and personality. Depending on the illustrator's artistic style, interior renderings can be lively, moody, exuberant, and, above all, charming. Few rooms can't benefit from being immortalized on paper. I recently discovered the interior illustrations of the immensely talented Beth Scanlon. Beth is the artist behind the wonderful cartonnage, decoupage, and diorama creations that are sold at Hollyhock and via her website, Scanlon Apparati. 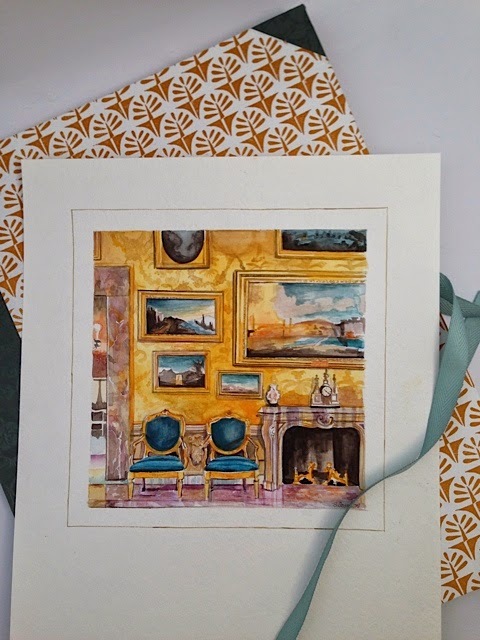 Beth has recently branched out into interior watercolors, trying her hand at painting rooms such as the Glass Beaded Salon at Oranienbaum as well as contemporary interiors by designers like Suzanne Rheinstein and Nina Campbell. 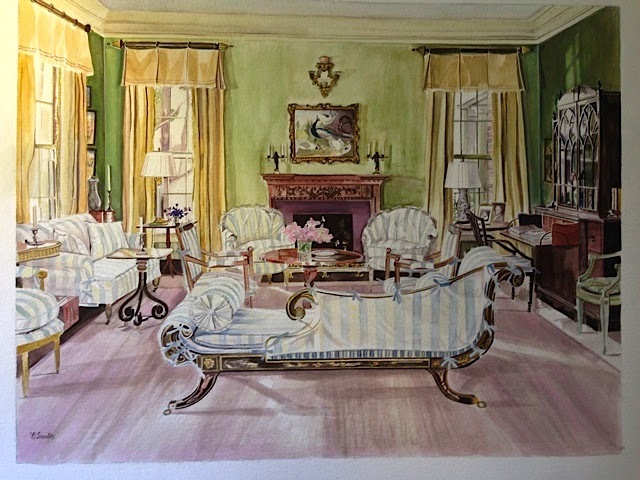 In fact, Beth was kind enough to paint a rendering of my living room, which she based on a photograph that appeared in The New York Times. You can see the painting above. I mustn't forget to add that Beth's watercolors are presented in elegant Italian paper-covered folders, which are handmade by Beth. My folder was made of Italian blue marbled paper, which seems to perfectly match my blue living room. Beth's paintings are available by commission through Hollyhock. If you wish to commission a watercolor or make inquiries, you can contact Hollyhock. And I urge you to view Beth's work both on her website and that of Hollyhock. If you're anything like me, you will want to place a mighty large order. 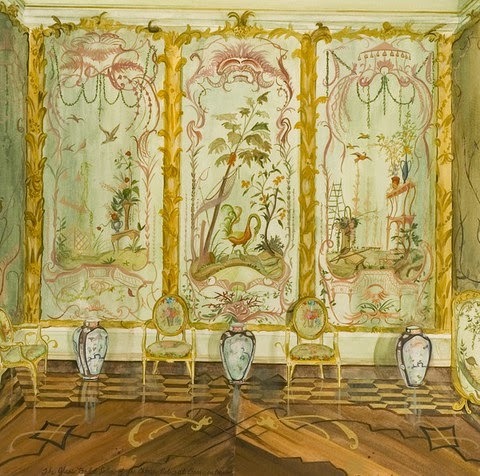 One of Beth's very first watercolors captured the Glass Beaded Salon at Oranienbaum. You might recognize the room above; it was decorated by Suzanne Rheinstein. 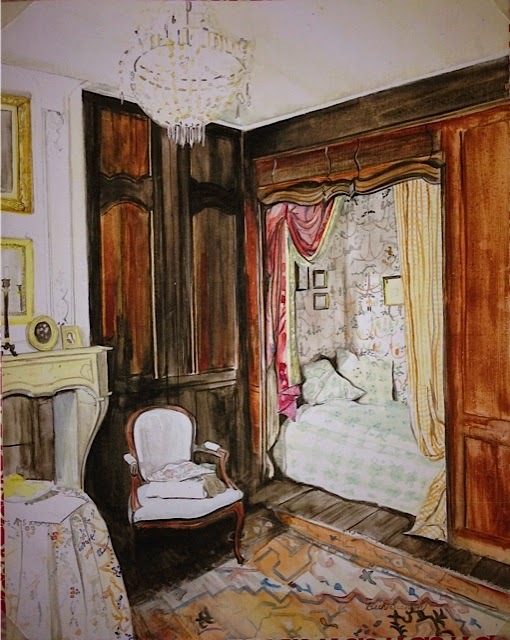 Beth based her illustration on Pieter Estersohn's photograph of the room. This illustration was based on a photograph by A. Branca. 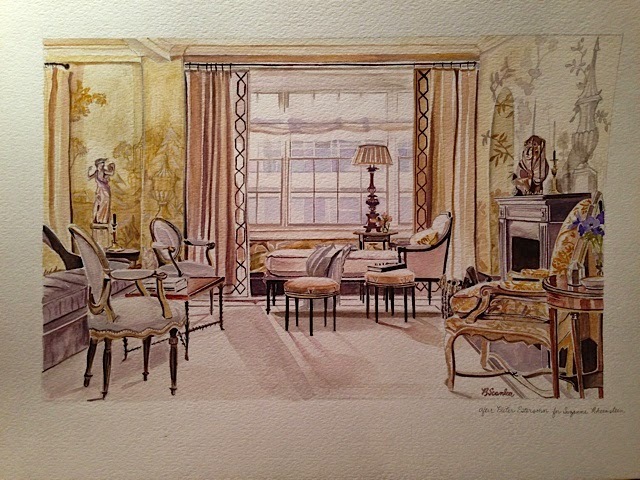 A watercolor of a room that was decorated by Nina Campbell. 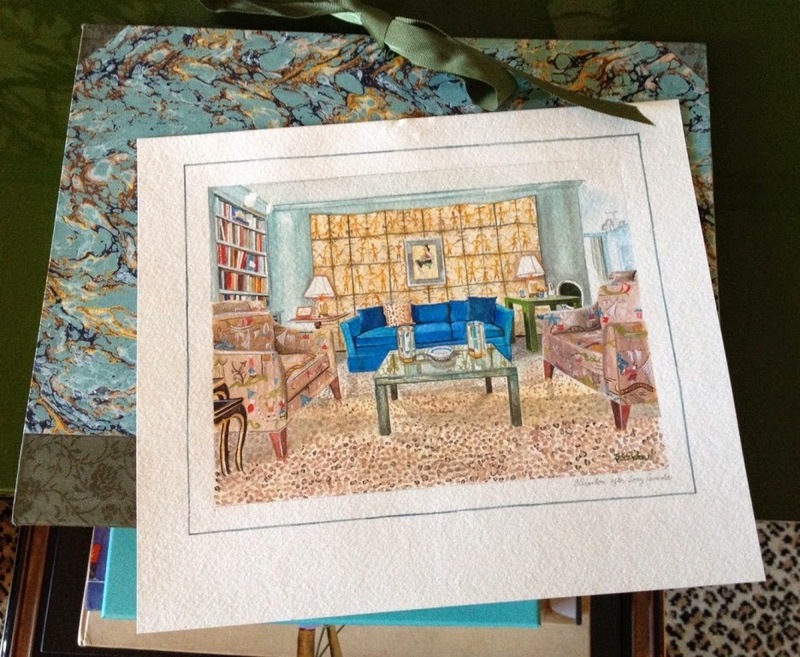 It was another room by Suzanne Rheinstein (and another photograph by Pieter Estersohn) that inspired this rendering. 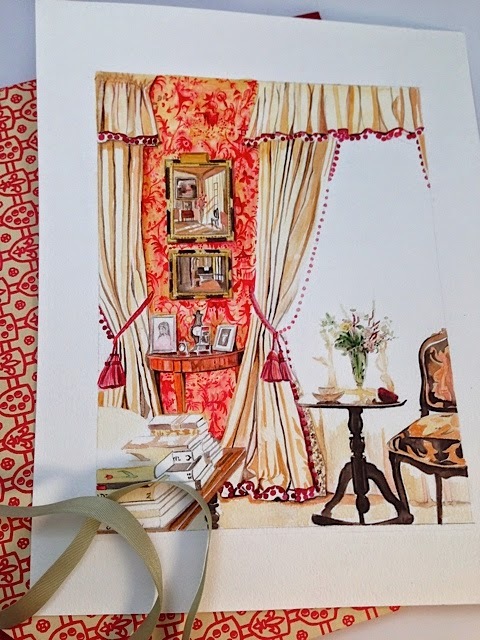 This charming watercolor was inspired by a photo that Beth saw in Cote Est. The room was photographed by Christophe Dugied. 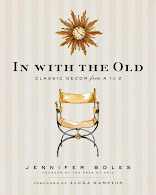 The photo at top by Jennifer Boles for The Peak of Chic; all other photos used with permission from Beth Scanlon. Your room looks terrific – beautifully rendered. Dear Blue, I enjoy reading and learning the tale behind pictures and design. this is so wonderful -I adore this art form. It takes the room down to the essence I think without some of the other details which detract from that. I've also loved her dioramas, I really need to get to Hollyhock someday to see them in person. Bravo!!! I love house portraits and room portraits. Bravo is such a lovely word. I hope I can remember to employ it more often. Bravo certainly due to Jennifer, she wrote a very nice post from a great deal of rambling words I sent with my photographs. I look forward to reading your work. Sometimes an illustration of a room can convey more about its essence than a photograph. You must know I adore all the sketches and watercolors and elevations you use to illustrate your posts. Thank you for the inspiration and commenting here. Beautiful works of art. 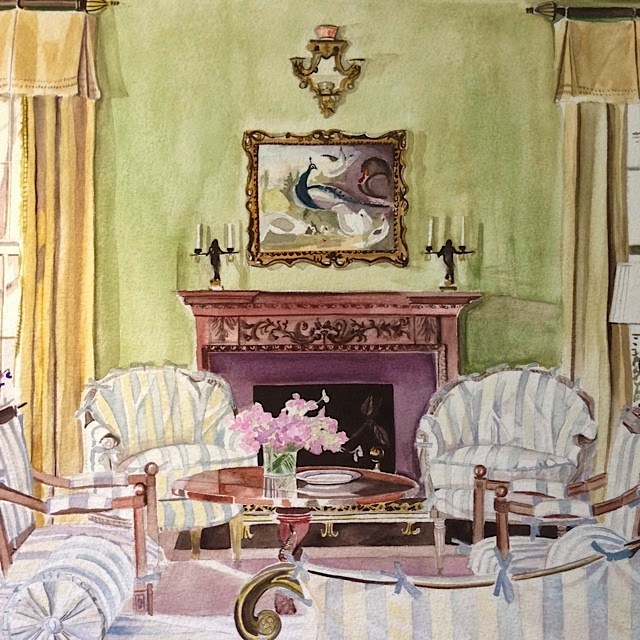 The illustrations in watercolor give a more ethereal look to any room, in my opinion. Yours is lovely of course Jennifer! Not only are you writing on interesting topics, I read your supportive comments everywhere. So kind, and always reflecting that you have read and thoughtfully considered the authors words. Thank you, I enjoy your sunny Florida pictures. These are exceptional renderings! She really captured the mood and colors of each room beautifully. I like the loose style of her paintings too. Something I want to try and achieve more in my own paintings. Bravo Beth! You introduced me to Elizabeth Hoopes! When you wrote that post I was living in her home town of Sewickley, PA. I was smitten and studied her style by printing your post and painting after her as closely as possible to learn where she was looser with the detail. I gave one of those studies to my mentor, Anne Genter, when I left Sewickley. Anne knew a close family member of Elizabeth Hoopes and saw some of her original work in his home in Florida. 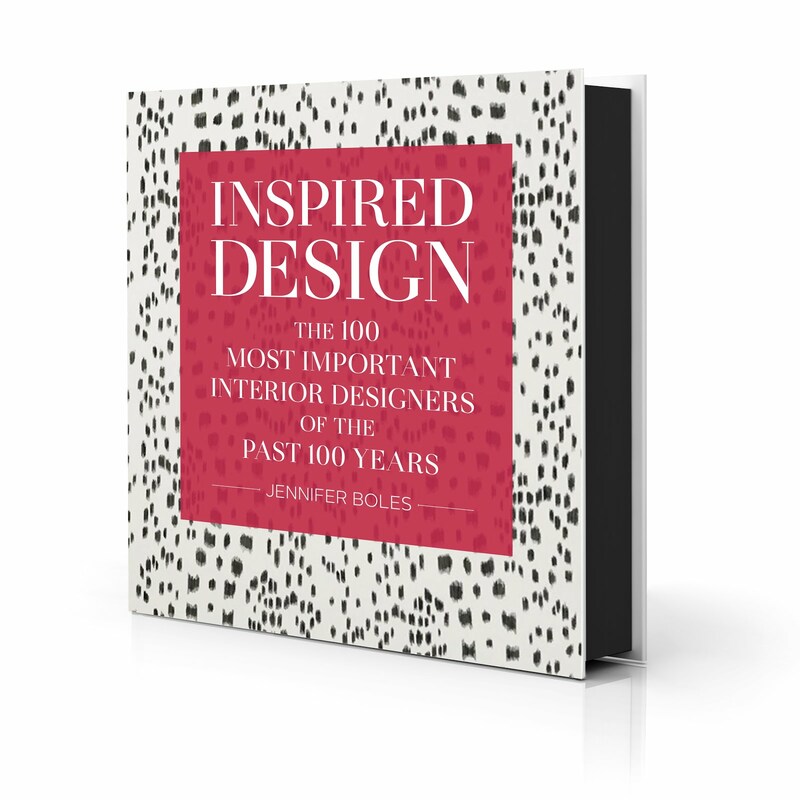 I am still keeping my fingers crossed for a book by McMillen, Inc. Your work, Michael, is brilliant, you are in the Zega and Dams category. I will continue to enjoy following your career. Thank you. Thank you so much for your kind words! And what an amazing story and connection. How wonderful it must of been to see Elizabeth Hoopes paintings in person. I think your paintings are truly lovely and they really do have a Hoopes style and quality. Keep up the good work and please do let me know about your continuing work. Thank you Jennifer for helping us make this connection!